When I was pregnant with my third baby, I had a pretty elaborate postpartum freezer meal plan. Having easy dinners that you can just heat in the oven is pretty awesome. This time around, for baby #5, I’m not really planning on doing any elaborate freezer cooking. If I’m being totally honest, freezer cooking is exhausting! It’s a lot of effort, and I know the reward is worth the effort, but I have not had time to pencil any freezer cooking sessions into my days. With that said, I am making a list of easy, peasy meals and snacks that my husband will be able to pull together for me. I am blessed that he gets to stay home for a few weeks after the birth of our baby. It’s only been with our last two babies that he’s been able to take any time off, and it is so wonderful to have his help! So, I’m keeping ingredients for our favorite meals on hand, and making sure he has easy access to the recipes. If you really want to bless a new mom and her family, bring her a yummy meal. She will be ravenous, especially if she’s a nursing mama, but she definitely won’t feel like cooking. Without further ado, here are some of my favorite dinners that would be perfect for new moms! Creamy Ranch Chicken over Egg Noodles – You can make the creamy ranch chicken in the slow cooker. If you’re taking this to a new mom, you can mix the egg noodles and the chicken together and it should turn out okay. I store mine mixed in the refrigerator. For sides, I love green beans. A salad would work nice, too. Don’t forget some rolls! Chili Mac– This is a classic, easy, frugal favorite. It’s something my husband can make in a pinch and it travels well! Tortellini Soup – I made this for dinner tonight, actually, and I’m planning to freeze the leftovers. Any type of hearty soup would be perfect for a new mama. Chicken Spaghetti – One of my dear friends brought me chicken spaghetti, salad, and Texas Toast after the birth of my last baby. It’s so filling and delicious! Fruit – bananas, apples (great with peanut butter), oranges, grapes, berries, kiwi, melon, etc. 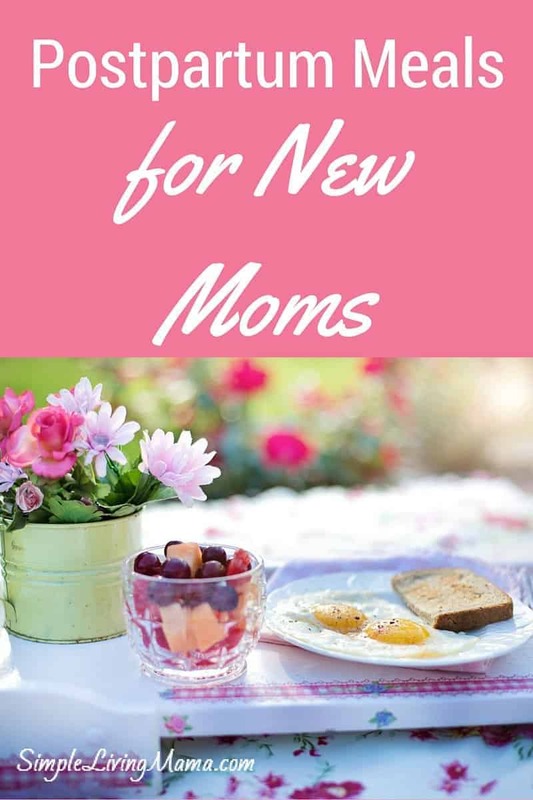 If you’d love to bless a new mom, I have a few tips for bringing those meals over. Bring only disposable items. If you bring a casserole dish, make sure it’s one you don’t care about because you might not see it for a while. I recommend putting meals in disposable aluminum pans, or containers that the new mom can keep. While you’re at it, bring paper plates and cups, too! New moms don’t feel like doing the dishes! For a special treat, bring the new mom some dessert to go with her meal. Fruit salad, a pie, whatever. Bring a gift basket of easy snacks she can eat at another time. I recommend granola bars, trail mix, and other packaged things she can keep in a basket beside the chair she will be using to nurse. 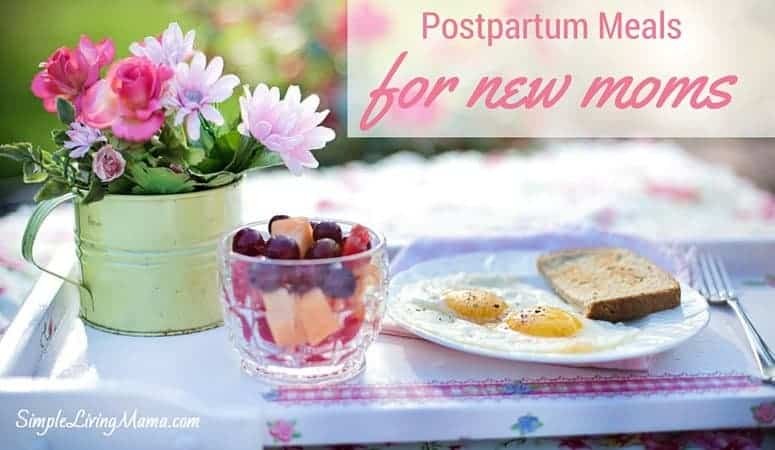 What are some of your favorite postpartum meals for new moms? Any tips you have to share?